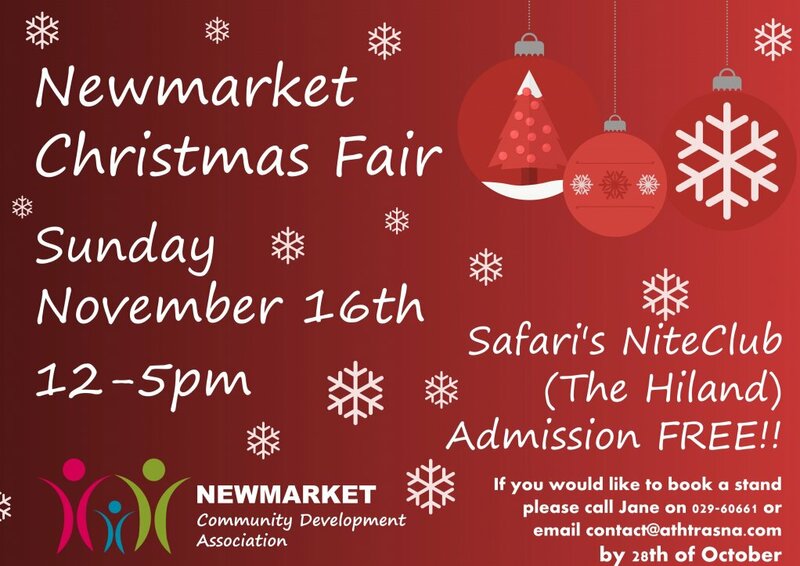 Newmarket Christmas Fair will take place this Sunday at Safari’s Nite Club (the Hiland) between 12 and 5pm. This is our fourth year running this highly successful fair and it has gone from strength to strength each year. This year we have even more on offer, 55 stands showcasing the best of local produce, crafts and businesses: food, clothes, plants, gifts, decorations, cosmetics, and a huge range of crafts to name but a few. 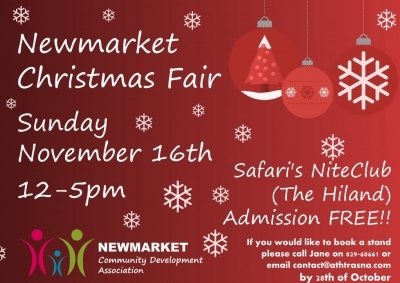 It’s a great opportunity to get your Christmas Shopping done whilst shopping local! And here are 10 important reasons why you should shop local this Christmas and indeed all year round. Ní neart go cur le chéile (in unity is our strength) – Áth Trasna Abú! Shops in our town create local employment and self-employment. These people in turn spend in the local community. Local independent shops invest more in our communities. Local businesses are proportionately more generous in their support of local charities, schools and community events. Supporting local shops means a financial impact on your community. Our local businesses continuously contribute to our voluntary organisations, our schools, they contribute towards the decoration of the town over Christmas, the St. Patrick’s day parade and much more besides. Local shops sell a wide range of great products at affordable prices. Many people fall out of the habit of shopping locally and are then surprised by the range of products and gifts available. Shopping local saves you money. Out of town shops have done a good job of convincing us that local business equals expensive. If you add travel, fees to transfer items and your time, the overall cost is often much higher. People don’t like losing shops and services in small towns but don’t equate this to how they spend their money. Shopping local retains our distinctiveness. Independent shops create distinctive shopping experiences and stock different products. Local businesses respond quickly to the needs of local customers, stocking products to meet the changing population needs. If you don’t see it all you have to do is ask! Shopping local saves the environment. Local shops often stock a high percentage of local sourced goods which do not require long car and bus journeys, helping reduce our global footprint. Most people can get to their local shops easily and this is especially important for the elderly and young generations and those without transportation. Evidence from numerous surveys show people receive better customer care and service locally. These businesses survive by their reputation and repeat business, which means you get a higher standard of service. Private and public sector services tend to cluster around shops. As shops disappear so do hairdressers, banks, restaurants, etc.